Famous story of Aladdin. One of the first book, with short story on Aladdin. There once lived a poor tailor, who had a son called Aladdin, a careless, idle boy who would do nothing but play all day long in the streets with little idle boys like himself. This so grieved the father that he died; yet, in spite of his mother's tears and prayers, Aladdin did not mend his ways. One day, when he was playing in the streets as usual, a stranger asked him his age, and if he was not the son of Mustapha the tailor. "I am, sir," replied Aladdin; "but he died a long while ago." On this the stranger, who was a famous African magician, fell on his neck and kissed him saying: "I am your uncle, and knew you from your likeness to my brother. Go to your mother and tell her I am coming." Aladdin ran home and told his mother of his newly found uncle. "Indeed, child," she said, "your father had a brother, but I always thought he was dead." However, she prepared supper, and bade Aladdin seek his uncle, who came laden with wine and fruit. He fell down and kissed the place where Mustapha used to sit, bidding Aladdin's mother not to be surprised at not having seen him before, as he had been forty years out of the country. He then turned to Aladdin, and asked him his trade, at which the boy hung his head, while his mother burst into tears. On learning that Aladdin was idle and would learn no trade, he offered to take a shop for him and stock it with merchandise. Next day he bought Aladdin a fine suit of clothes and took him all over the city, showing him the sights, and brought him home at nightfall to his mother, who was overjoyed to see her son so fine. Next day the magician led Aladdin into some beautiful gardens a long way outside the city gates. They sat down by a fountain and the magician pulled a cake from his girdle, which he divided between them. Then they journeyed onwards till they almost reached the mountains. Aladdin was so tired that he begged to go back, but the magician beguiled him with pleasant stories and lead him on in spite of himself. At last they came to two mountains divided by a narrow valley. "We will go no farther," said his uncle. "I will show you something wonderful; only do you gather up sticks while I kindle a fire." When it was lit the magician threw on it a powder he had about him, at the same time saying some magical words. The earth trembled a little in front of them, disclosing a square flat stone with a brass ring in the middle to raise it by. Aladdin tried to run away, but the magician caught him and gave him a blow that knocked him down. "What have I done, uncle?" he said piteously; whereupon the magician said more kindly: "Fear nothing, but obey me. Beneath this stone lies a treasure which is to be yours, and no one else may touch it, so you must do exactly as I tell you." At the word treasure Aladdin forgot his fears, and grasped the ring as he was told, saying the names of his father and grandfather. The stone came up quite easily, and some steps appeared. "Go down," said the magician; "at the foot of those steps you will find an open door leading into three large halls. Tuck up your gown and go through them without touching anything, or you will die instantly. These halls lead into a garden of fine fruit trees. Walk on till you come to niche in a terrace where stands a lighted lamp. Pour out the oil it contains, and bring it me." He drew a ring from his finger and gave it to Aladdin, bidding him prosper. Aladdin found everything as the magician had said, gathered some fruit off the trees, and, having got the lamp, arrived at the mouth of the cave. 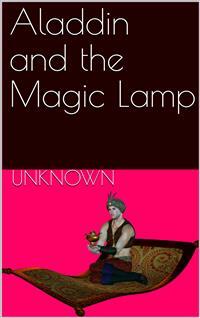 The magician cried out in a great hurry: "Make haste and give me the lamp." This Aladdin refused to do until he was out of the cave. The magician flew into a terrible passion, and throwing some more powder on to the fire, he said something, and the stone rolled back into its place.